I am still keeping my resolutions! Yoga is my favorite exercise to keep my mind clear, and focused on the future. 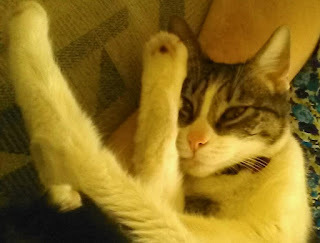 As a cat I live in the moment, but my experiences make me who I am. 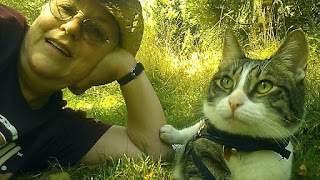 For those readers whom I have not met, I am an adventuresome cat, who prowls tours the country in a Winnebago motorhome. I travel with my chauffeur, personal assistant, and co-author, Judy Howard who insists that I give her some credit. 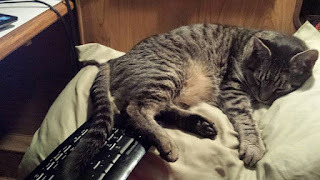 Many people are saying my rise to popularity has only come about because Judy is a top ranking author on Amazon, and that I am riding her coat tails tales tails to gain publicity for my first novel in my FELINE FURY SERIES titled, ACTIVATE LION MODE, which will be on the shelves this spring. Some are whispering that I am sleeping with her, to achieve my success, but I decline to sniff at those tails tales twitching in the wind. I get around. Many of my friends are successful authors, though some are ghostwriters. That is why you have never heard of them. My new friend Johnny Cat is a best selling mystery writer who writes under the pen name of Deb Sanders . While Deb goes hiking for hours in the Arizona, here is my friend Johnny Cat, exhausted after finishing his latest mystery, DEAD MEN DON'T TALK . He doesn’t like the responsibility that fame entales entails, so he allows all credit to go to his personal assistant, Deb Sanders. Not me. I love my fans. I am happiest when my fans beg to pet me. I can hardly wait for my book, ACTIVATE LION MODE to be unleashed released. It is the first in my new FELINE FURY SERIES about one of my nine lives. As Judy and I travel through the Olympic National Forest, we have a terrible accident in our motorhome and Judy is whisked off to the hospital. I am left to fend for myself in the wilderness of the Olympic Forest. In the beginning, I am excited about the plot that fate has delivered to me. I always dreamed of living in the wild. 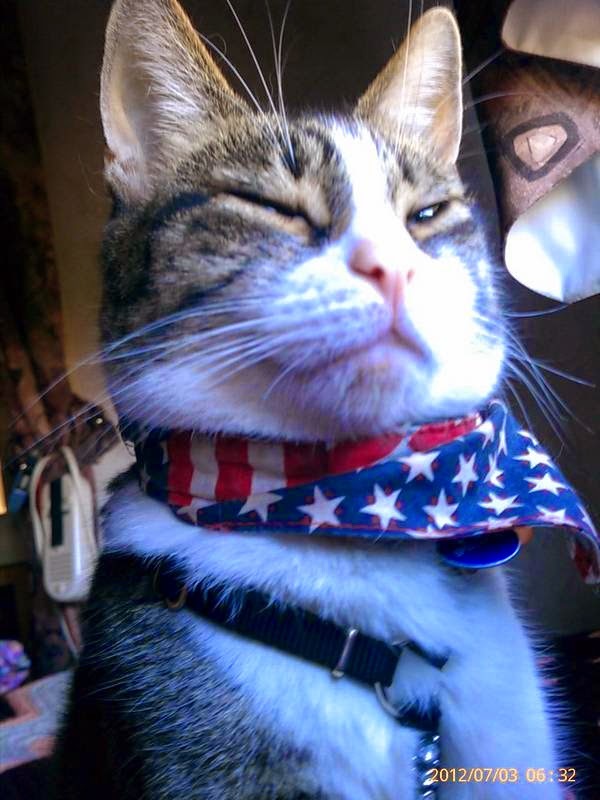 I begin on an adventure that every cat and every person dreams of , Living Free, until…. Ooops! No more. Just bat that around for a while. Until then, I posted a teaser below. My eyes sprang open. The hair on my back stood on end. Judy’s scream pierced my ears, joining the howls of the protesting motor home. My sleek graceful body slammed against the windshield. Outside, the screech of the tires mixed with strange sounds of groaning metal and crackling fiberglass. Our sanctuary lurched off the road, airborne, like the birds I envied. The windshield, which insulated me from the dangers of the outside world crammed painfully against my ribs. Jagged lines crawled and crunched across my once, unobstructed view, while branches, rocks, and dirt spewed up and pounded the varicose pattern. The glass wall of security gave way. 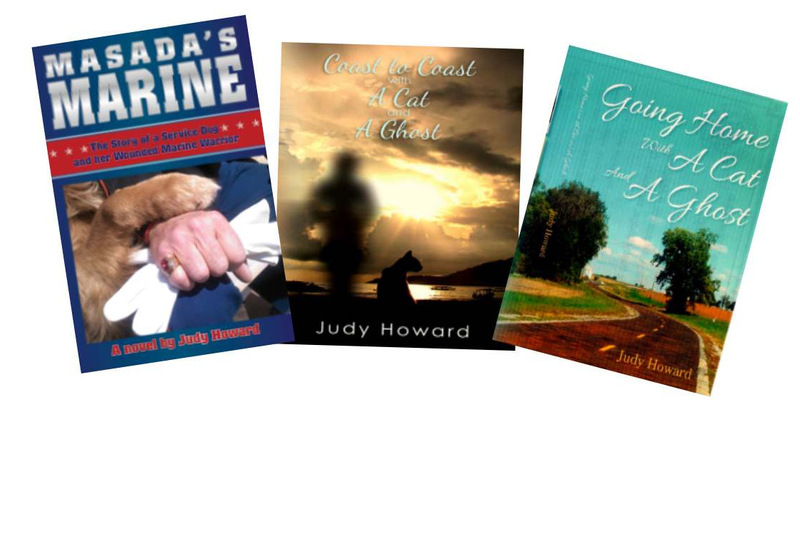 While you wait, panting with anticipation for my publication check out Judy Howard's books on Amazon.